I love to sketch when traveling. 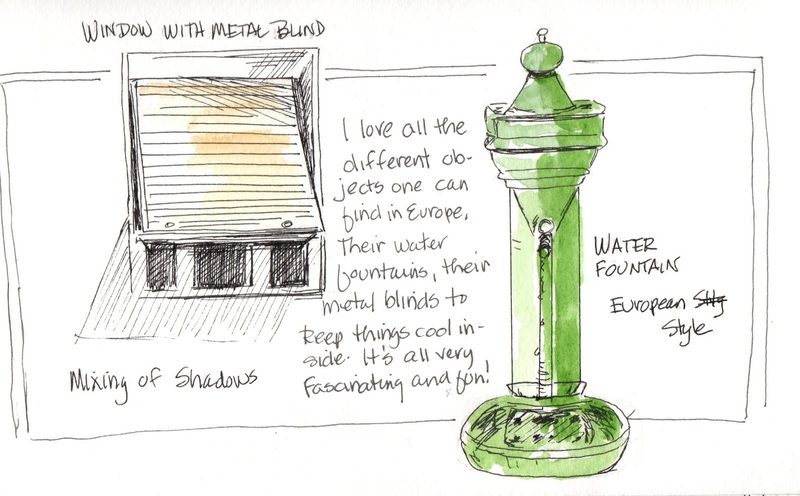 That's why I take students on sketching trips, like the one we're planning in May. It's such a fun and exciting experience. I started off sketching back in the year 2000 while living in England for a summer. I bought a book on drawing and spent a lot of my time fiddling around with pencil and paper. 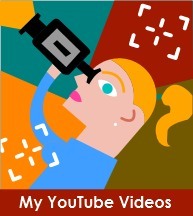 It started out as a something-to-do activity,which eventually evolved into a passion for me. Okay, some friends would say an obsession. What I usually take with me. Small is the word to use when traveling. Not only do our suitcases have to be smaller these days, but so do our art supplies. I learned a long time ago that carrying a load of stuff is not only wasteful--you don’t use most of it-- but also tiresome--it all weighs too much. 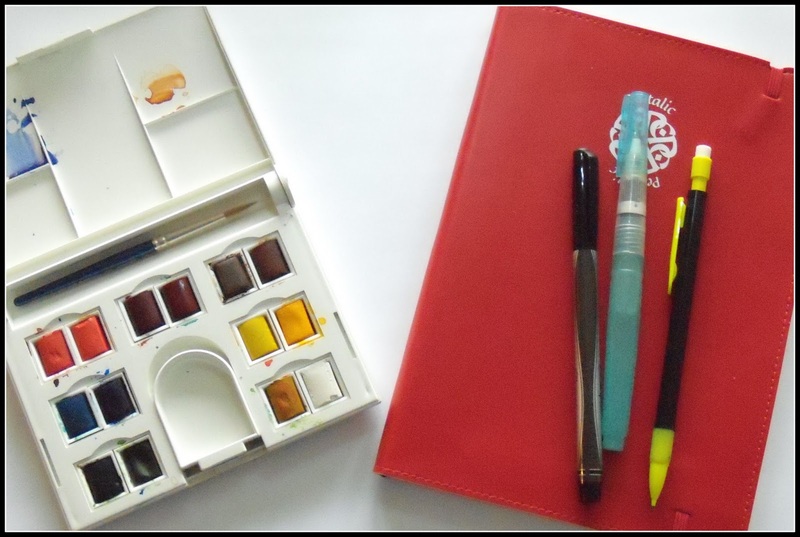 A watercolor set I buy or one that I create. That’s it in a nutshell. All the other things can stay home. If it can’t fit inside a small satchel/backpack, then it shouldn't accompany you. Paper should be heavy enough to tolerate wet media. The book is small enough to fit into your backpack and have at least 25 pages, but no more than 100 (gets too heavy). The cover should be durable. Sketchbooks with flimsy covers will prove to be a big disappointment. In no time at all, the cover will be torn, bent or even gone. You can choose between a stitch-bound or spiral book. There are advantages to both. I like stitch-bound 5” x 8.25 Moleskin® and the Pentalic® books that open flat, have a smooth paper surface, heavy enough to tolerate water and have a pocket in the back. I like being able to draw across both pages. 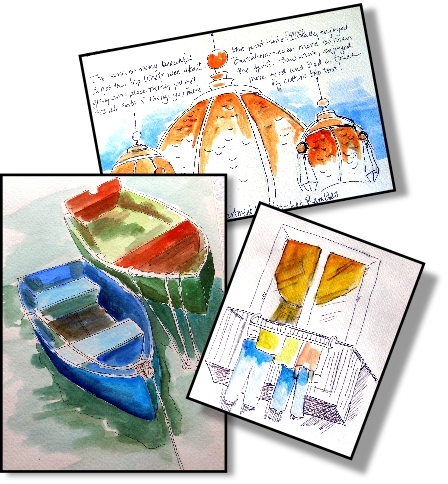 They come in different types of paper as well, including watercolor,with good covers. Their biggest disadvantage is I can’t tear out a sheet very neatly. I also like the spiral Nature Sketching books by Pentalic®. The paper is 130#, which is perfect for inking and wet watercolor washes. The covers are flimsy so I usually glue the first couple of pages to the front cover and then collage it, based on the theme of the sketching project. The best size is what’s comfortable for you. For years, I stayed with only 9 x 12. I would not recommend anything larger than 11 x 14. The larger the sketchbook, the more cumbersome it is. I don’t enjoy working with itsy-bitsy sketchbooks either. If you only took your sketchbook and a mechanical pencil, you’d be set for an entire day of sketching. I love mechanical pencils because they are always at the ready. For one, you have a sharp point with no sharpener necessary. For another, you eraser is conveniently attached. Plus, most of these pencils come with good plastic white erasers, which can take the toughest pencil marks off. They come in different softness (usually sold with HB lead or #2). Now that they are so cheap (set of 6 for $1), you can afford to take a couple with you. 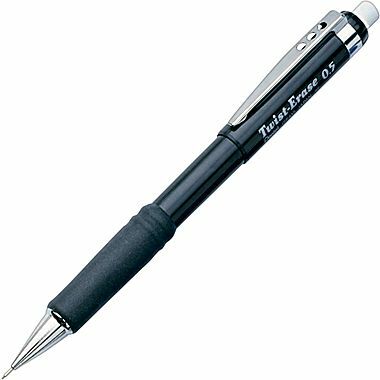 I personally like the Pentel Twist-Eraser® pencil. The eraser is rather long, which you twist up as you need more. Mechanical pencils also have different point sizes. I usually work with 5mm, but they also come in 7 mm and 9mm, which are bolder lines. I’ll cover more on point sizes when I cover pens. Do I ever use regular pencils? Of course, I use the standard wooden pencil, my favorite being those that are sold in sets with hard and soft pencils. But I use wooden pencils mostly in my studio, utilizing the softer pencils for shadows and darker forms in my illustrations. While I prefer using mechanical pencils outside, they do require some getting used to. We all have a tendency to press hard on our pencils at the tip–-even at an angle. If you do that, you will find that your mechanical point will break off more often. So I suggest holding your pencil a bit less angular and with a more tender touch. My mode of sketching is laying down a quick pencil sketch first, add some pen work, erase the pencil marks and add color. It’s quick and easy. Finding that perfect ink pen may take more time. That’s because there so many pens from which to choose. But for the moment, I am only going to discuss the permanent pen. How can you tell a permanent pen from a water-soluble (one that bleeds when touched with water)? Simple, it will state so on the with the words permanent or waterproof. If the pen says nothing about permanence, you can pretty much consider it water-soluble (made with water-based ink). However, with so many new pens on the market touting they are water-resistant when dry or fraud resistant, it makes you wonder. I've tried some of these and found them to be inconsistent. Most smear, some a lot, some only a little. To be on the safe side, I stick with pens that indicate they are permanent. Drawing pens also come in varying nib widths or what others call points. They range from 0.03 to 1.0 or higher. I like to stay within the .05 range—just in the middle. It gives me the perfect line. I use the other sized nibs for my studio work. For brands, I like Micron® and Uniball®, which comes in fine and micro—either one will do. Next month, I’ll cover using the water brush and watercolors on-site. 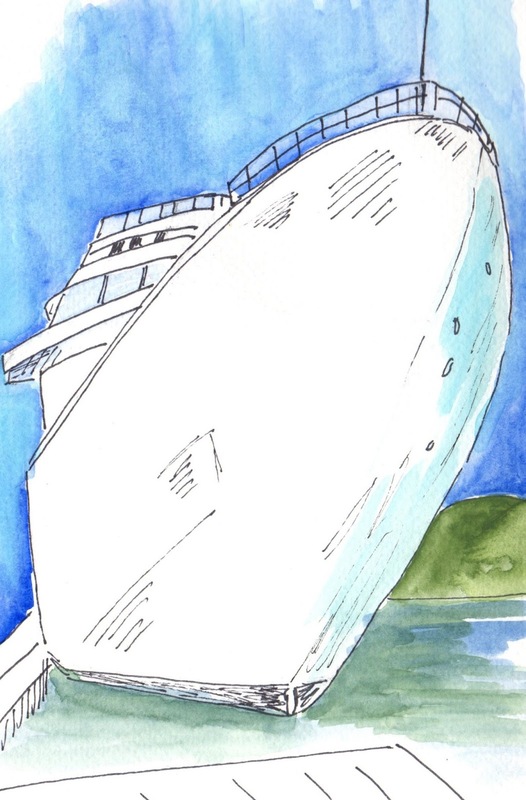 If you want to learn more this month, come to my Travel Sketching workshop at PCC on March 8th. Details below. In the meantime, check out my third free video on color mixing with Daniel Smith’s watercolor sticks. Please excuse the sound, rather scratchy--buying a new microphone today! This month, I'd like to cover the use of line, specifically hatching and cross-hatching. As most of you know, I teach drawing under the assumption there are only three lines: straight, angled and curved. 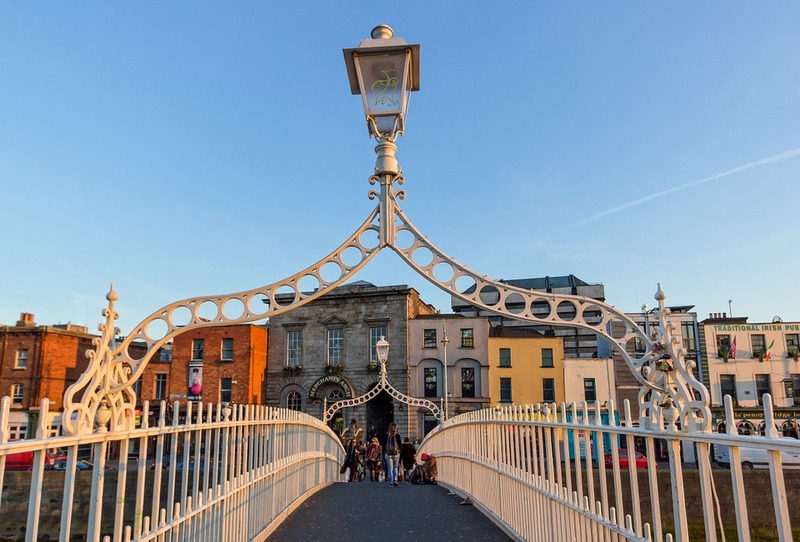 And while there are only three lines, we do twist, bend and turn them to our liking. One way we do that is by using the hatch mark that can create depth, shadow and texture. Below are the typical hatch marks found in drawing. 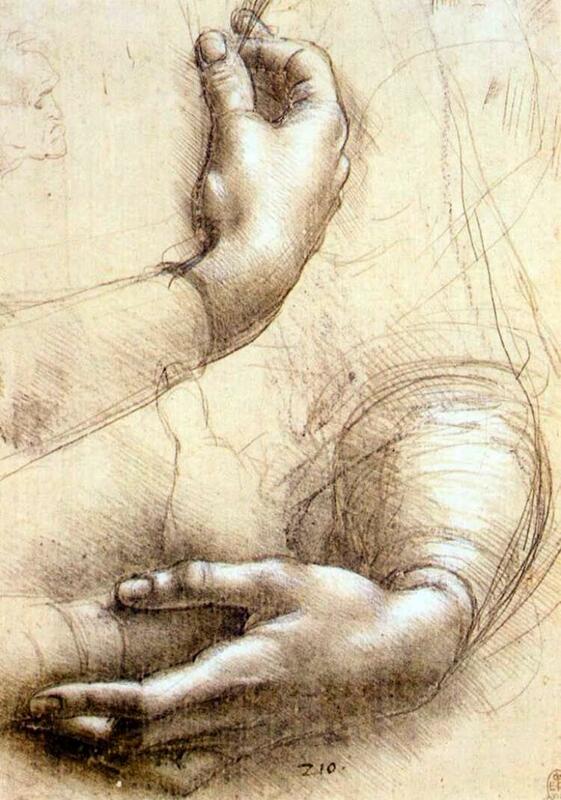 An excellent example of these marks appears in Michelangelo’s famous sketch of a female’s hands, possibly a study for the Portrait of Genevre de Benci . Notice the lines he uses around the wrists, fingers and sleeves. They are diagonal here and curved there, all giving the illusion of form. Most of them are hatch marks. 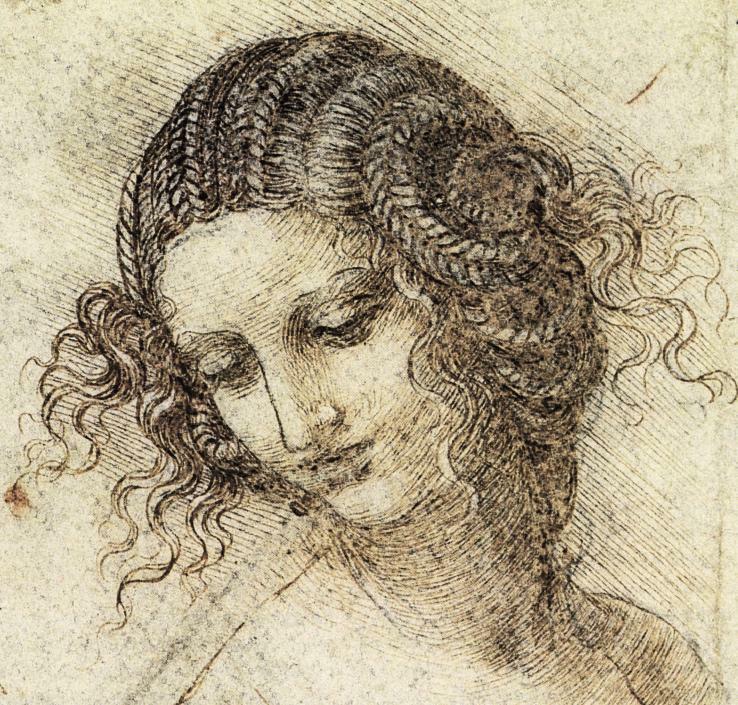 Notice in Leonardo da Vinci’s drawing, Study for the Head of Leda, the curved hatch marks he used to depict her hair. 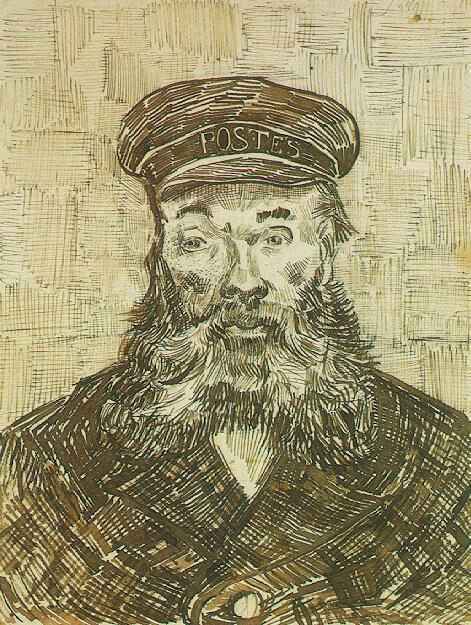 Here, Vincent Van Gogh used both hatch marks and cross-hatch to create tweed in his drawing, Portrait of a Postman. I thoroughly enjoy using these lines in my drawings. 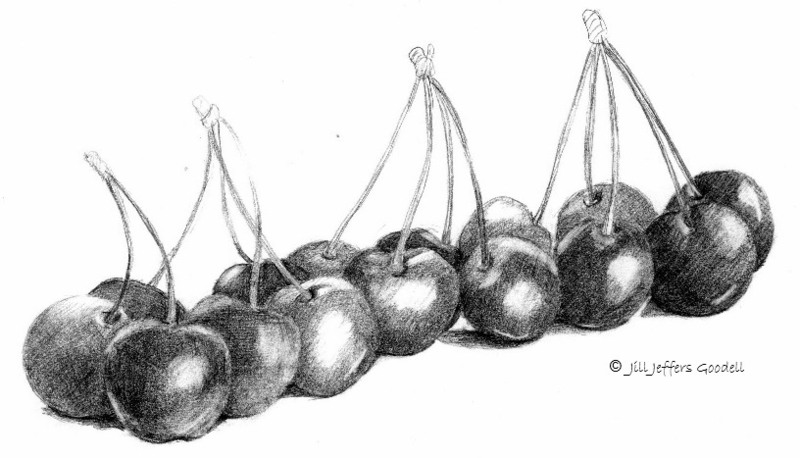 In my recent drawing, A Line-up of Cherries, I used them a lot. This was a fun project done over a few day’s time. Using hatch marks can be time-consuming, just like stippling, but in the end it is very rewarding. Want to know how I drew these cherries, view the following video that I recently created, Drawing with Hatch and Cross-Hatch Marks. Sorry the mic wasn't working quite right, but I think you'll learn a lot. Enjoy! Why not pick a subject this month and try to draw it using hatch marks to create form?